Puerto Rican boxing idol Miguel Cotto stopped Delvin Rodriguez of Dominican Republic in the third round of their junior middleweight bout at the Amway Center in Orlando, Florida. Cotto was clearly the aggressor from the first round up to the end of the fight. In the second round the Puerto Rican star caught Rodriguez with hard left and right combo that stunned the longtime title contender, looking dazed and disoriented at the sound of the bell. Rodriguez failed to regain his composure from the Cotto's early assault as he looked still disoriented at the sound of the bell to signal the start of the third round. Cotto took advantage of the situation and attacked Rodriguez with power left hook that sent him staggering into the ropes as Cotto followed it up with left and right combinations, forcing the referee to stop the fight early in the third round. Cotto, who is coming off two straight losses since winning his rematch against Antonio Margarito in 2011, is now looking at a very lucrative fight against Sergio Martinez of Argentina early next year. The win by Cotto over Rodriguez marked his first under Trainer Freddie Roach who took over from Cotto's former trainer Pedro Diaz. Roach, who also trains Filipino boxing star Manny Pacquiao, said his plan is for Cotto to attack Rodriguez's body first which Cotto did but the end came earlier than expected. "Anyone who lays on the ropes against Cotto is a dead fighter," Roach said. "We started with the body first to wear him down. Our plan was to break him down with body shots." For his part, Cotto gave credit to Roach, saying the victory was a product of hard work with the hall of fame trainer. "I felt the power go right through my arm. I hit him flush," Cotto said. "Thank you, Freddie Roach. This all started in my first day of training camp with Freddie Roach. All of this is from hard work with Freddie Roach at the Wild Card. It all came together. "I just wanted to make me and everyone happy with my performance. It feels good bringing it back to basics, fighting back at grassroots level." Cotto lost his WBO welterweight title to Pacquiao in 2009 via TKO but he gave Pacquiao a tough match all throughout fight. It was a classic fight and one of the most lucrative matches for Bob Arum's Top Rank Promotions. With Cotto's signing up with Roach, the thought of having Pacquiao and Cotto in a rematch seems to have faded as he could not possibly be at the corner of both fighters all at the same time during the fight. After suffering from twin losses at the hands of Floyd Mayweather and Austin Trout, Miguel Cotto barged his way back into the win column with a dominant third round stoppage win over Delvin Rodriguez at the Amway Center in Orlando, Florida, Saturday (Sunday, PHL time). 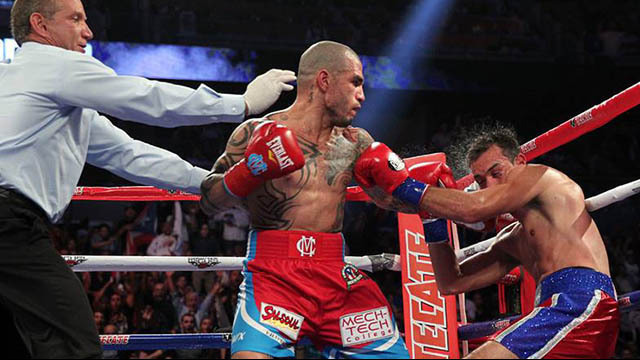 Cotto, who now trains out of Freddie Roach’s Wild Card Boxing Gym, dominated the short fight. He hurt Rodriguez early in the third round and the referee stepped in to stop the fight. The official time was 18 seconds into the third round. Most observers at ringside including ESPN’s Dan Rafael and Yahoo’s Kevin Iole noticed that Cotto was back to his old self. He tried to be more of a boxer in his last two fights, which really didn’t work for him. Against Rodriguez, Cotto went back to his brutal body attacks. With the win, Cotto raised his record to 38 wins against four losses with 31 of his wins coming by way of knockout. Rodriguez’s record fell to 28 wins with seven losses and three draws. Cotto hurt Rodriguez early with left hooks to the body. The Dominican Republic native tried to keep the Puerto Rican away with jabs, but he could not land them regularly. Cotto wobbled Rodriguez late in the second round with a big left to the body. Sensing blood in the water, he then went in for the kill early in the third. He landed a hook-straight combination followed by another big left hook, which floored Rodriguez. Referee Frank Santore Jr. then stopped the fight as Rodriguez was in no shape to continue. "He caught me with the left hook and I really felt the power," said Rodriguez, who also said that the stoppage was early. Cotto started off fast, sporting improved foot work from his previous outings at the weight and fighting with ultimate confidence. It didn’t take long for the former four time, three division champion to impose his will on the Dominican born Rodriguez. Launching a stiff double jab to conceal his true intentions, Miguel Cotto worked on the body of Rodriguez like the Cotto of old. Early on, it became clear that facing Indian reservation casino fighters did little to prepare Delvin Rodriguez for the near complete package that Miguel Cotto would bring to the ring. Cotto would continue to push Rodriguez around the squared circle and at the close of the second round, a hard shot Miguel landed to Rodriguez’s head stunned him for seconds following the sound of the bell. In the third and final round, the writing was all but on the wall for Delvin Rodriguez. Cotto, hunting and stalking lands a right hand to the body of Rodriguez as he’s pinned on the ropes, it is followed closely by a big left upstairs; Delvin Rodriguez crumples to the earth as referee Frank Santore Jr. intervenes and halts the bout at 2:42 of round number three. In the co-main event, Terence “Hunter” Crawford (22-0, 16KOs) totally shut out Russian import, Andrey Klimov (16-1, 8KOs) over ten lop sided rounds. The Nebraska resident began to hit his stride towards the end of the first round, after a feeling out process, Crawford began to land with solid counters and was able to out-speed the Russian. Early on in the match, Terrence Crawford figured out that if he switched to the southpaw stance then the Russian fighter would have absolutely no answers for him all night. Crawford was correct in his assessment as Klimov was unable to adjust to any of the sticking, moving or counter punching that came from the American for the duration of the contest. The unorthodox style that Crawford employed allowed him greater countering opportunities against the 31 year-old Andrey Klimov, who fought like he’s never been in the ring with a southpaw before. Despite a quite restless crowd, Terence Crawford kept his composure and pot-shotted, countered and jabbed the game Andrey Klimov to a total shut out on all three judges score cards. The Boxing Tribune also had it 100-90. 25-year-old undefeated Puerto Rican featherweight prospect Jayson Velez (21-0, 15 KOs) took a hard-fought unanimous decision from a more than game Dat Nguyen (17-3, 6 KOs) by scores of 96-93, 96-93, and 98-91. In a super featherweight fight, Felix Verdejo (8-0, 6KOs), 20, of Puerto Rico, took out Gary Eyer (11-4-1, 7KOs), 27, of Duluth Minnesota. Verdejo completely dominated and beat up Eyer for a TKO in the second round. A very excellent showing from the young Puerto Rican and a very fan friendly style may make this former amateur standout become must see T.V. one day. Also on the bill was Moises Carasquillo Jr. (4-0, 3KOs), 22, fighting out of Orlando, Florida as he took on Steven Chadwick (2-5, 1KO), 35 of Jacksonville, Florida. Both fighters were tight in the early going, however, Carrasquillo controlled much of the action through two. Chadwick managed to land a couple of glancing punches off the defense of Carrasquillo, but apparently the 35 year-old was better at posturing than was he at boxing. Moises Carasquillo Jr. pulls in a UD with all judges turning in a 40-36 score. In the first bout of the evening, Ricky Tomllinson of Thonotasassa, Florida (1-0-1, 1KO)gave Lamar Charlton, 35 (1-4-2, 1KO) all he could handle with his long reach, and good movement. Often times, Ricky’s faster hands led to him being first, however, the quicker footed Lamar Charlton was able to avoid most of the incoming punishment, and neutralize the advantages that Tomllinson brought. The two fledgling fighters fought nervous throughout the first half of the fight, leaving some to be desired, but both men should be featured on further Top Rank undercards – they both had decent showings and it reflected in the split draw that both men received after four rounds.